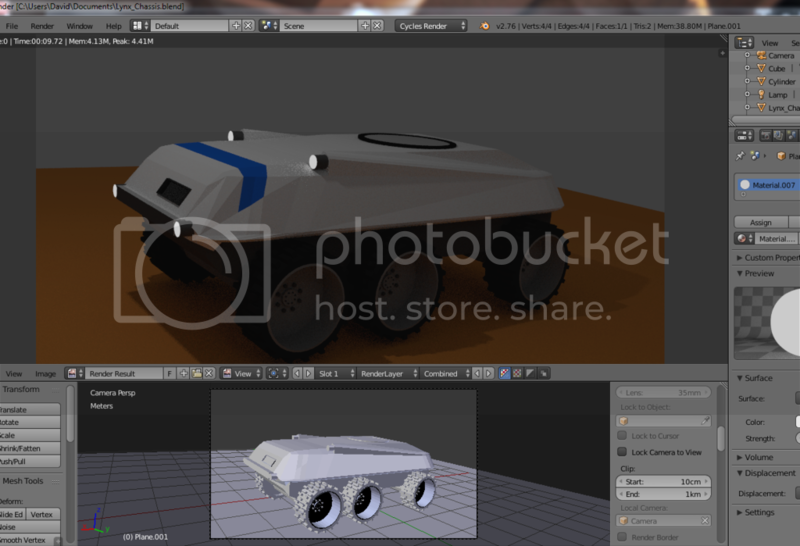 So I downloaded Blender today. First I am going to try my hand at building a Lynx combat chassis. 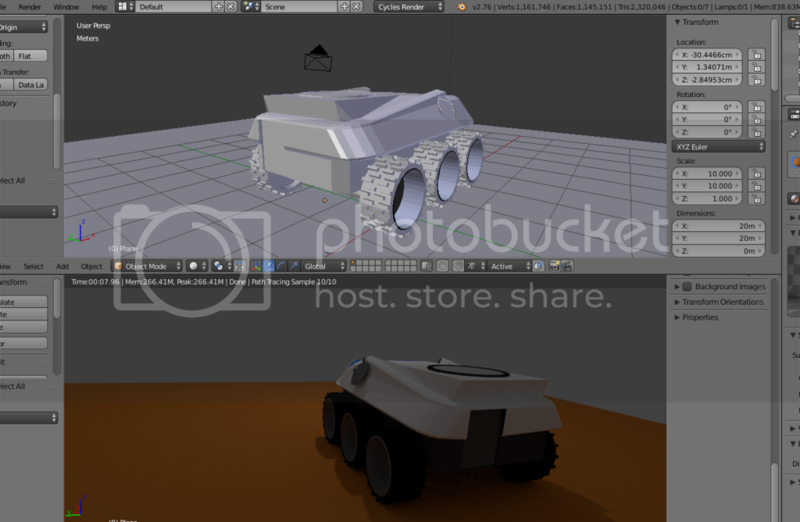 Just the chassis so that modular weapons pods could be added later. Anybody tried this? Have design suggestions? Anything a Lynx needs that I haven't thought of ie. 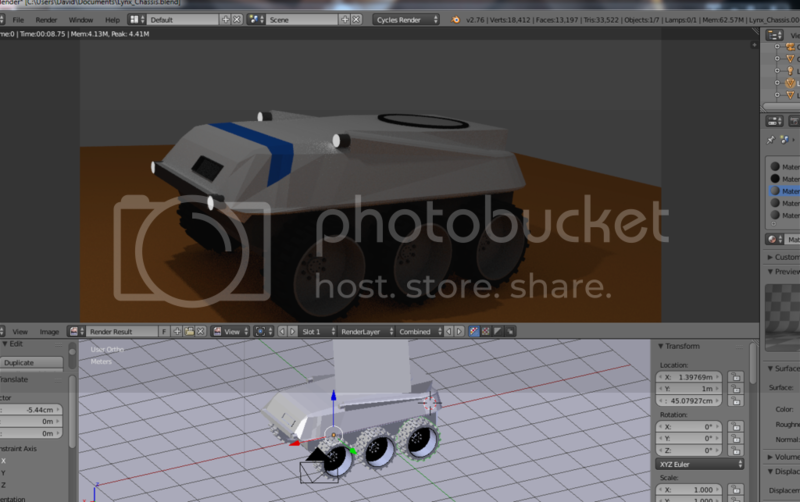 Wheels, lights, chassis, turret ring, view ports, access hatch etc etc. And where would you put the Eden or Plymouth insignia? And what colors should it be painted? Fenrisul released an archive of models. I think it contained the actual model data, not just renderings. I'm pretty sure there was a Lynx in there. I also remember Arklon once posting a nice big detailed picture of a Lynx taken from the game. I think it was part of the mission briefing graphics. The sort of thing that is easily forgotten about. Got it. I downloaded those and imported them into blender. Most of them are very simple shapes, built as polygonal models for in game (use less resources, game runs faster, yada yada yada) basic outlines or structures of the buildings, probably can be used as a starting point for some more complex and detailed models. The Lynx chassis I am constructing is about 80% of the way towards public viewing. I hope to use it as a basis for all other models I would like to draw up, design cues that could be carried on from model to model. Also I have seen a bunch of different drawings and designs for the Lynx so what I am starting with is in no way the finished product, I will need outside suggestions to complete something everyone can agree on, and if not everyone than something a large a majority of people would accept. Maybe that works, coming from Photobucket, and whatever, you get the point. So let me go ahead and describe why this looks the way it does. I looked around for a bunch of pics of the lynx, some showed all three side wheels close together, others two front one aft, I chose this for now. Tires I chose this direction as rubber isn't going to be plentiful on New Terra so inflated tires would be non existent, also they live on a rock basically. Where would the power receiver dish go? This is not the finished product! HELP please. Go ahead Internet. Lets make this better. Looks slightly more rectangular than I would have expected. Also, way better than anything I would ever be able to come up with. Curious question, how do you know it's the aft wheel and not the front wheel that's offset? With the swivel turret, it's hard to tell front from back. Is this based on headlights? And yes, I've wondered about the wheel offset thing myself. Edit: Might be a good idea to version control your model. I know of version control but not how its structured or what constitutes a change. Also, yeah best guess on design at this point, and from any and all support from the community. I didn't run a large scale render as I want to play with textures and shading and all that other mumbo jumbo. If you don't already have an SVN write account, you can pester Leviathan for one. Basically create a folder, call it something like "Models", throw the files in there, and commit them with a message along the lines of "Initial Lynx model". As you work on the model, and complete a change you like, check in the changed file with a new message such as, "Moved aft wheel". Or some people prefer dropping the past tense, and instead describe what the change does if applied, such as "Move aft wheel". I sort of feel like I'd need to look at a picture of a Lynx to really know where to go with it. It's been a while since I've looked at a large picture of one. ... and from the new wiki. I remember seeing one with one tire aft a bit, and now I'll never find it. Oh well. Maybe version two will have all three centered. So, more or less in the right direction? And yes the lights and the black viewport if there was a human driver make that the front with turret swivel aft of center rear of vehicle. This will be the last of updating for today. Leave some comments, I'm open to designing it in anyway as I could use some more ideas. Also, if Hooman is reading this does this seem like a good structure for version control? Tips? I can change the structure anytime just curious. p.s - Version 2.2 will see the addition of a weapon pod to gauge proportioning for future steps, what should be the first weapon I mount up? And if anybody wants usable game versions I will have to build some lower polygon versions, the tires alone are responsible for over 40'000 faces and vertices. What do you mean by a good structure for version control? Do you mean your list of changes for the commit message? I certainly wouldn't mind seeing what you've written for the changes in a commit message. Oh no, all I was trying to get across is I have never used version control so i wouldn't no where to start. Like every little change should be documented and have change number? Or just after several changes and I push I out to the public? And when i do that what should be the numbering system? I wonder if I would ever make enough changes to label them as 0.0.1, 0.0.2, 0.0.3 or should I stick to a smaller numbering system like 0.1, 0.2, 0.3? And a commit message would be a separate text document listing changes? Once I get comfortable with this software I will probably start making models at a lower resolution to start with and then start uploading them to the SVN with doc changes and version numbers. Right now I'm still fumbling my way thru. You don't assign version numbers when checking in changes. The version control system has its own internal version numbers. You don't need to know what they are, and they have little relevance for typical work. At best they're a handy short name for what is better described by the commit messages. The 3 dotted numbers, Semantic Versioning, is what you'd use for tagged versions when doing a release. This has no resemblance to the internal version numbers used by normal everyday commits. Don't worry about it at this point. I don't think you need it, and even if you did, it's something you can learn and do after the fact since you're just tagging existing versions (identified by a single auto generated number) with a human made tag. The commit messages aren't written into a separate document along with the rest of your files. The notes are attached to the commit, and exist separately from the files under version control. If you're using TortoiseSVN, there is a dialog box that pops up when doing a commit which has a text box for your commit message, and also displays a summary of all the changed files that will be included in the commit. If you're using svn from the command line, you'd specify the commit message as a command line option. svn ci -m "Commit message here describing the changes for this commit"
Ideally commits should be small and often. Not every commit needs a public release. Releases to the public, which occur less frequently, can become tagged versions. You don't need to worry about tagged versions and releases at this point. Ask Leviathan for an account with write access, and grab a copy of TortoiseSVN. It's actually quite straightforward to use, and comes with good help and examples. I can always walk you through the process once you're setup with an account and the software. I got TortoiseSvn already and have been playing around a little bit. Still have to learn how to create and upload once Lev does get me access...unless he already did. I have to check when I get home. I have two more models and some extra pieces that I could upload soon. Which once I'm home I'll upload snaps here first. Thanks for the help guy! Looks nice, but a big question is... HOW THE HELL DID YOU GET SO MANY FACES AND VERTICES? That one vehicle has more faces and vertices than an entire town in Skyrim. I would imagine that partly answers your question. And here I had thought you had accidently subdivided something far too many times. Generally, unless you are up close and personal with the tires (ie a first person shooter) then putting detail into tires is important. 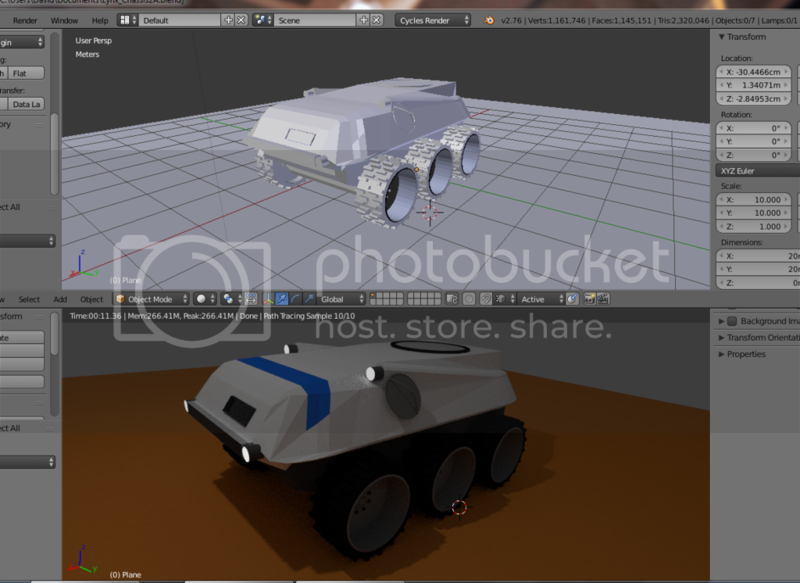 But, if you consider the top-down perspective for Outpost 2, you can barely see the tires and thus not much point in having excess detail for something that can't be seen anyway.